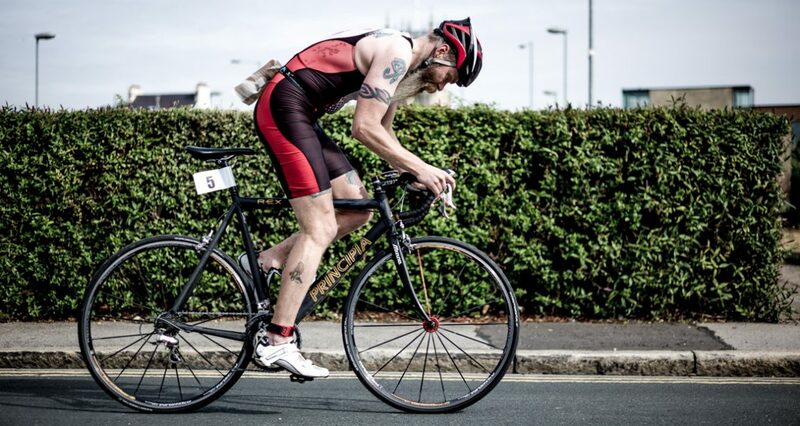 Beards and Triathlons | This blog is all about a man with a beard who does triathlons. Today I ran the brand new parkrun along Morecambe Prom, and brilliant it was too. Potentially a very fast parkrun as it is completely flat, much like Fleetwood parkrun. It was nice and sunny as well, although very cold. I wasn’t particularly speedy as I had decided to make a long steady run out of it by running the 8km there and back as well. You can see by the photo below that the newly refurbished prom is nice and wide, and with ten minutes to the start there were plenty of people milling about. My beautiful wife and unruly dog were also there, but had sensibly opted to drive, giving a lift to a neighbour. The run itself starts at the southern end of the prom and heads north past the famous Midland Hotel. It was funny seeing the blank faces of the guests eating breakfast as a couple of hundred runners went past, much like a dog being shown a card trick. There’s a short out and back on the Stone Jetty before continuing along the prom, and then turning around and coming back. As with out and back courses it’s great to see runners going in the opposite direction, whether it’s the speedy ones near to the front, or cheering on the slower runners nearer the back. In the parkrunning community there is a ‘thing’ about completing inaugural parkruns, which can be a bit of a problem for the organisers. It can take time for a new team to become smooth, and it is therefore better if the first few parkruns are a little smaller and gradually build in size. It can also impact upon people who use a park (or prom) on a Saturday morning and aren’t expecting hundreds of runners to be there. Parkrun UK don’t overly advertise new parkruns for this reason. Morecambe Prom parkrun was on the UK parkrun website a week before the first event, but sometimes a new parkrun might only go ‘live’ the day before. My wife mentioned that there had been a few people in social media who hadn’t known about it. That’s the idea, and hopefully those people who missed out on the first event will come along in the next few weeks and months. Today there were 264 finishers, with people from all over the place, including lots of friendly faces from Lancaster. Many of those people might make Morecambe their ‘home’ parkrun if it is closer. It might also impact upon Lancaster, which wouldn’t be a bad thing as the narrow paths make it a little crowded, especially with over 400 runners. History has shown, however, that whenever a new parkrun starts up, runners new to parkrun start running, and other parkruns nearby barely reduce in size. Morecambe Prom parkrun has the potential to be able to accommodate many more runners, and hopefully it will attract many new runners from the immediate area. Overall it was a fantastic first event, and one that both me and my wife are looking forward to running probably once a month or so. A couple of weeks ago I ran Canalathon, a 50km run from Manchester to Sowerby Bridge along the Rochdale Canal (read about it here). When I managed to upload it to Strava and then Veloviewer I found out that I had nabbed another 20 tiles, although none of them are added to my Maximum Cluster. This got me thinking about what the potential is, of the tiles that I added, to be added to my cluster. The map above shows the bottom edge of my cluster, and the blue line is the route for Canalathon. As you can see I’m only a few tiles away from adding these new tiles to my cluster, in effect a high cluster potential, which is good. The other extreme would be when me, my beautiful wife and unruly dog all went to Skye for a week. We managed a couple of rides (read about one of them here) and a few runs, and over the week notched up another 50 odd new tiles. However, it is over 400km from the my new tiles to the northern edge of my cluster in Carlisle, so the potential for adding these tiles to my cluster would obviously be very low. Never say never, there are some mighty large clusters out there. As I mentioned in the last couple of posts, last weekend me and my beautiful wife went to Sowerby Bridge as I had entered the 50km Canalathon, which I blogged about earlier in the year (read about it here). We set off on the Friday, and as expected we got stuck in traffic. As we reached Sowerby Bridge I noticed a camper van with the race organiser’s logo emblazoned on the side. Much to my wife’s dismay I waved at the driver, who waved back. Good start to the weekend I thought. My wife had booked a hotel for the two of us plus Nelly, our mostly well behaved pointer. However, the hotel was at the top of a very steep hill, with narrow roads and far too much traffic. Not easy. Hotel was nice, room was clean and tidy, so we went off for a walk into Sowerby Bridge to forage for food. As I’ve mentioned many times, we are keen parkrunners, so the Saturday morning we headed to Shroggs Park in Halifax to complete our fiftieth parkruns (read about it here). The rest of Saturday was spent pottering around Hebden Bridge before heading back to the hotel for some rest, food and a bit of reading. We also took Nelly for a walk who managed to catch a baby rabbit. I had also purchased Running Up That Hill by Vassos Alexander as inspiration for my big race. (You can read a book review here). The next morning we were up early, too early, but it did mean that we snagged a parking spot almost as close to the race HQ as it was possible to get. I picked up my number, complete with timing chip, goody bag and had my kit checked. There was an extensive essential kit list, most of which was obvious; food, water, hat (not a buff), gloves, waterproof jacket, a cup, head torch and waterproof over trousers. Last year me and Helen completed a half marathon in the Trough of Bowland in horrendous conditions (read about it here), so I’m all for essential kit lists. The cup is a good idea so that single use disposable cups are not required. However, the cut-off for the 50km race was 6.30pm, when it would be still light, and the forecast stated that there was less than a 5% chance of rain. Therefore, after my kit check, I removed the head torch and over trousers from my lightweight running bag, hoping that there wouldn’t be another kit check in Manchester or at the finish. There were also two other races; 75km and 100km versions. The 75km started in Sowerby Bridge, went to Oldham and returned. The 100km went all the way to Manchester and back. The 50km race, which I was doing was just from Manchester to Sowerby Bridge, along the Rochdale Canal, hence the name, Canalathon. Buses were provided, if required, to transport people to the start, so we watched the 100km runners set off and then I jumped on the bus, while my wife and our dog would keep themselves occupied walking, eating and reading. To be fair, Nelly didn’t do too much reading as she was still happy from catching a rabbit the day before. Once at the start there was a huge queue for the portaloos, so the start was delayed by 15 minutes. I couldn’t believe how many people there were. A friendly bloke called Dom told me that there had been 250 entries for the 50km race. I stayed chatting with Dom all the way to the first feed station at 10 miles in Rochdale. He was an experienced ultra runner having completed both the 75km and 100km versions in previous years. My aim in the race was to hopefully finish in less than six hours, although I really wanted less than five. We were definitely going a bit quick as we passed 10km in just under the hour. We were also amazed when the leader of the 100km race passed us in the opposite direction when we’d done almost 13km. It meant that he had done over 37km in less than three hours, although he still had another 63km to go. I spent some time faffing at the feed station with my kit, before eating some salted new potatoes and using my cup, which was really annoying as I couldn’t find anywhere to put it where it didn’t bang about. I couldn’t see Dom, so I assumed that he had already set off. I didn’t mind as I quite like running on my own, and there was plenty of other runners about. The canal started to get a bit more scenic as we were now out of the built up areas, and just before three hours I came to the second feed station, which was close to the top lock. Downhill all the way to the finish. More salted potatoes, more flat coke and a handful of jellies. Ultra running really is like a kid’s party; there’s peanuts, sweets, coke and lots of running around. It was about now that I had the first of my vegan energy balls that my wife had made me. The ginger and chocolate ones coated in chia seeds. They gave me a well needed boost. If you search out Bunny’s Bakes on Instagram or Facebook, my wife’s baking business, she is hopefully going to be selling her energy balls soon. Unfortunately, as soon as the canal started to head down, my left knee started to complain. I ignored it and focused on passing the marathon mark in less than four hours, which was a good mental boost. I knew that I was going to finish, even if I had to walk the last five miles, but I was still on course or a sub five hour finish. Through Todmorden, large cobbles to navigate at a lock, and into Hebden Bridge. Having walked this section the day before I knew there wasn’t far to go. A short rise and I phoned Helen to let her know my expected arrival time, before finding a surprise feed station at just under five miles to go. Everything was hurting at this point. If I’m going to do more ultra runs I definitely need to do more long runs, not just two, with the longest only being 30km. I had been counting down lock numbers from near to the start, and would only allow myself to look at my watch to check time and distance when I reached the next lock. I was now counting down bridge numbers as well, knowing that they would be at ‘two’ when the race came off the canal. We had also recce’d the route from the canal to the finish so that I would know where to go, knowing that my mind would be in a mess by the end as well. What was interesting was that there was an old disused cycle speedway track next to the finishing field, where I had raced back in 1988 with the Hull Cycle Speedway Club. We had finished runner’s up in the Yorkshire League Cup. Past the cycle speedway track and onto the field where smiling Helen and excited Nelly were waiting. I crossed the finish line in four hours and 49 minutes. Very pleased, but also very tired. Need food! I had completed my first point to point ultra run. T-shirt and bobble hat will be worn with pride and the medal is with all my others on display. The whole event was brilliantly organised by Cannonball Events, and very friendly. I don’t generally like to enter the same races again, but this is one that I would consider doing next year. If you want to have a go at an ultra race, this is the one for you. Only 8km longer than a marathon, if you do the 50km race, not too hilly and almost impossible to get lost. A final big thank you to everyone involved, especially all of the amazing marshals, and to Dom, who hadn’t set off in front of me at the first feed station and finished only a couple of minutes behind me.